Marti Malloy is a living American story. A product of humble beginnings, Malloy has made a name for herself in the international judo scene through effort, dedication and never letting the hard times get the best of her. Currently, she is ranked 1st in the nation, 3rd in the world, and is also an Olympic hopeful for the 2016 Games in Rio de Janeiro. Malloy grew up on Whidbey Island, a small community off the coast of Washington State, where many military families settle due to the naval base stationed on the north side of the isle. Her father was a career military officer in the Navy and the benefits of that position eventually led the offspring of the family into the sport. She began training at the earliest age the recreational center allowed, though wanted to begin a year earlier at the age of five. Showing her promise early, Malloy won nearly every junior match she entered from her childhood into her teenage years. As any youth growing into their adolescence, however, the young judoka wanted to participate in the activities of her peers, an instinct that can easily distract any serious competitive athlete. She attributes her mother as the guiding influence that kept her on track. Aside from being the parental figure teaching how to make decisions, the mother also contributed financially, rallying together any extra money to support her daughter develop further into the sport. “We always worked hard and my dad always had a paycheck being in the military. We weren’t the kind of family that went hungry, but as a family of five, you don’t have the luxury of things like spending money on new school clothes. We didn’t always have money, and my mom always saved dimes and coins and go to those coin machines to cash them in to pay for all my judo stuff,” Malloy says describing her childhood. I ask if the family’s financial situation had any influence on her performance during competition. She takes a moment to think about it before she answers. Her mother worked a number of odd jobs, perhaps the oddest being a part-time breeder of purebred Chihuahuas. According to Malloy, Chihuahuas with the right paperwork, history and lineage can go for anywhere from $600 to $1000, a significant side income that allowed the family to send Malloy back and forth to California once she outgrew the training capacities of the naval base. After graduating high school, she made a more permanent home of the Bay Area by enrolling at the San José State University and later becoming the first female captain of a judo team primarily composed of larger males. “It was my job to keep these guys in line and if people were messing up, I had to yell at them and so on. At first it was hard for me because I was like, ‘How do I tell a bunch of guys what to do or expect them to listen to me or respect me?’ but then I realized that you lead by example. You work hard and you do morally correct things,” says Malloy. With martial arts still a predominately male venture at the time, it was uncommon for a female athlete to be appointed the lead spot, and though Malloy contests that nobody ever treated her differently due to her gender, the three years she served as team captain didn’t come without its challenges. For Malloy, the journey to the top has been one of steady progression. In judo, the ranking process is based on a point system and those points are dependent on the number of tournaments won over the course of a career. 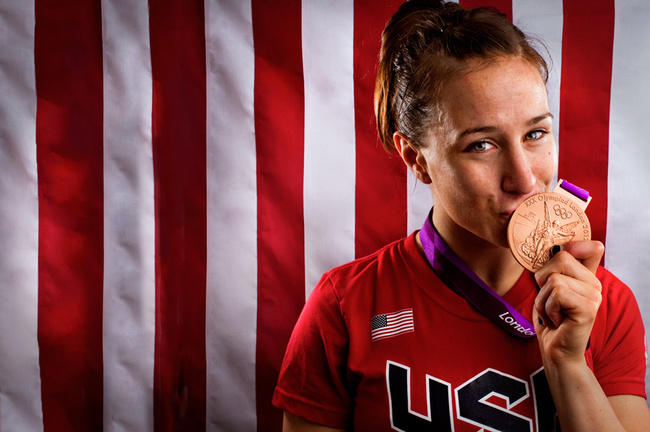 Her international ranking began in the high teens and rose in accordance with her tournament triumphs, most recently a Gold at the 2014 Pan American Judo Championships, and of course a Bronze at the 2012 Olympics, making her the second American female to medal in judo, the first being Ronda Rousey. In Rousey’s new autobiography My Fight/Your Fight, Malloy is credited as one of the only American judokas to have ever bested the UFC champ, though Malloy downplays the significance of the anecdote since it happened when they were kids. I’d argue that regardless of age, the memory managed to leave a big enough imprint to be mentioned in the book and probably speaks to her abilities to operate at such an elite level. In fact, looking closer at their lives and respective judo careers, there are some eerie similarities between Marti Malloy and Ronda Rousey—the Olympic Bronze medal, the strict yet supportive mother-figure, the winning attitude—it seems like the Washington native could easily make the transition. However, despite their similarities, Malloy has no plans on following her predecessor into the MMA arena. “I’m more of a judo purist, like it’s the only sport I’ve ever done and I don’t really feel any desire to do other martial arts. At my age it’s not something that I would want to take on and it’s also not something that I’m passionate about. I’m passionate about judo. I would just be pretending to care if I tried to do MMA,” Malloy laughs. “I’m a fan of it. Not a fan of doing it." Currently, Malloy trains twice a day, six days a week, interchanging between strength and endurance conditioning with judo practice everyday. Her immediate goals are landing a spot on the 2016 Olympic team and winning a gold at the World Judo Championships later this year in August. She is also studying for her Masters Degree in Mathematics and Computer Science at San José State University. While the tasks of pursuing a Master’s degree and gunning for world championships may seem daunting enough, financially speaking, the burden has lessened. Earlier in her career, Malloy worked a number of side jobs in sandwich shops and doctors’ offices to support herself through training, but once she began placing at international tournaments, sponsors and committees stepped in and now she can train as a full-time judoka. The change has been a dream come true for Malloy. There is a constant tinge of disbelief in the way Malloy speaks about her position in life, despite also having a complete awareness to all the effort she’s put in to earn it. It is reflective of the humility she’s managed to retain while reaching the top of the sport, and it is at this point that I realize that Marti Malloy represents many of the ideals this country strives for—hard work, dedication, respect and a boldness to step up and overcome the obstacles thrown at us in life. At least for me, there isn’t a finer character this country could send to represent itself on a world stage.